Our primary goal is to provide customers with state-of-the-art technology, maintain a dedication to developing genuine partnerships, and offer superior knowledge of the textbook industry in an effort to simplify course material distribution for educational institutions. That's why we employ dedicated teams of customer service and sales representatives, and operations personnel to ensure each of our customers are offered the same attention to detail. Our staff of more than 1,000 is often referred to as the MBS Family. With so many longtime employees, the company has developed a welcoming atmosphere that makes it easy to feel right at home from the moment you walk through the door. We make it a priority to promote from within and to continually provide challenging opportunities in a stable work environment. In fact, during the last year we have been able to promote over 85 employees into various positions throughout the organization. We strive to offer a comfortable, employee-friendly work environment, so our dress code is casual allowing you to wear jeans, t-shirts, sandals, tennis shoes and other presentable options. Our company is built on the strength of its people and we are proud to employ a diverse group of individuals with varied life experiences and cultural backgrounds. We foster our work force and continually seek ways to accommodate, empower and motivate each employee’s unique background. MBS supports a wide variety of organizations including Heart of Missouri United Way, Central Missouri Food Bank, Voluntary Action Center, American Heart Association and Job Point as well as provide college textbook scholarships at the University of Missouri and Columbia College. We take our commitment to the growth and development of the entire Columbia community seriously and are always looking for new ways to contribute and positively affect others. I have a lot of positive feelings towards my place of employment. Probably, right at the top of the list is the fair manner in which MBS, as an employer, welcomes people from other nationalities, providing opportunity without prejudice. Meet Accounts Payable Clerk, Nermina Halilovic, who thinks MBS' wonderful people, flexible hours and convenient location are just a few of the reasons that make MBS a great place to work. 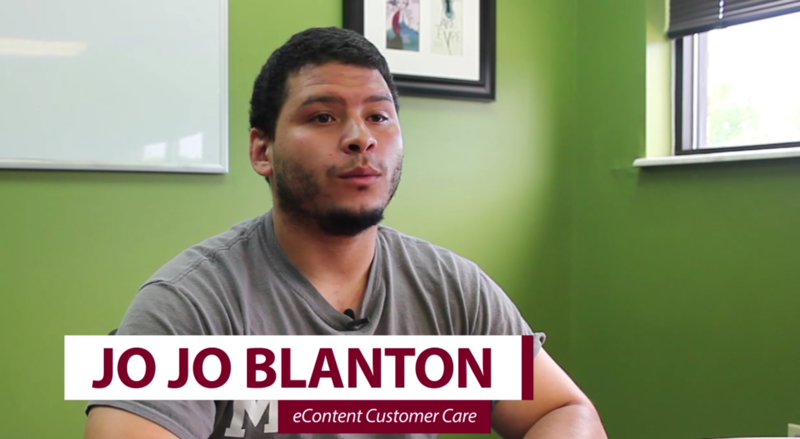 See why eContent Customer Care Specialist Jo Jo Blanton thrives on being able to guide his customers step-by-step through the ordering process, turning each potentially stressful situation into a positive one. 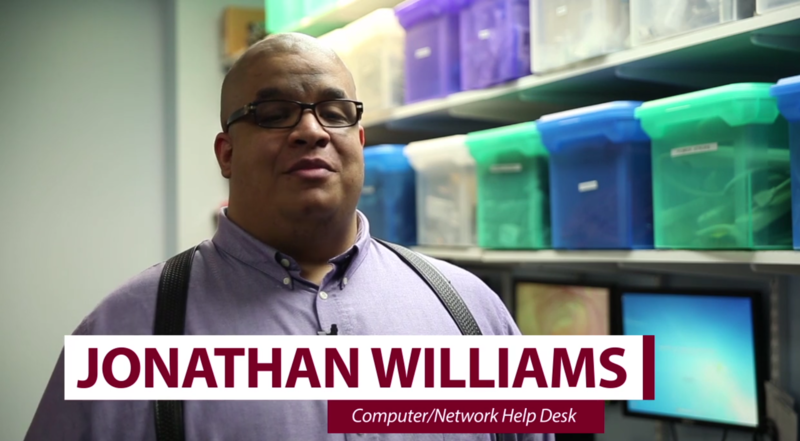 With opportunities for advancement around every corner, Jonathan Williams explains why the IT department at MBS is the perfect place for him to launch his career. My favorite part of working at MBS is my coworkers. I've been fortunate to work with some really great people, many who have taught me a lot and I have a great group of employees who work for me. MBS is committed to the health and well-being of our community and offers a variety of benefits to support our employees and their families. Health insurance, underwritten by Anthem Blue Access PPO, provides coverage throughout the United States. Office visits through a Blue Cross network provider incur a $20 co-payment. The co-payment covers expenses billed through the network provider's office. MBS pays a significant portion of the monthly premium for all coverage options. Two options are available for dental insurance coverage. Both are indemnity plans and allow freedom of choice in selection of a dentist. Both options provide preventative care service with no deductible and 100% coverage. Basic care and major service needs have a $50 deductible and limited percentage coverage. Term life insurance is provided at no cost. Coverage is provided at twice an employee's annual base salary. Dependent life insurance is available to eligible dependents, if the dependent is covered under MBS health insurance: free term life for the spouse of $5,000; free term life for children age 6 months and older of $2,500. Accidental Death and Dismemberment (AD/D) insurance is provided at no cost and covers employees for accidents that result in death or dismemberment. Coverage is provided at twice an employee's base annual earnings. Short term disability is funded fully and solely by MBS and is designed to provide employees with pay continuance during an illness or injury that is related to a disability which requires the employee to be away from work. Long term disability provides pay continuance in the event that an employee becomes totally disabled and is unable to work. The coverage becomes effective when the employee has been disabled and away from work for a period of 180 days. The MBS 401(k) Profit Sharing Plan enables participants to save for retirement with contributions into either a traditional 401(k) plan with pre-tax contribution, or a Roth 401(k) plan with after-tax contributions. Employees may contribute up to 80% of their earnings each payroll period, plus MBS will match up to 6% of eligible compensation each pay period. MBS may contribute a lump sum amount from the profits of the previous year into the plan. The flexible benefit plan allows employees to pay for certain expenditures from pre-tax earnings. Eligibility is effective the beginning of the third month of employment. Expenditures allowed include: health, dental or other elected benefit options premiums may be paid from pre-tax earnings; Health Care FSA; and Dependent Care FSA. Available to full-time, year-round employees, earned time off (ETO) is a combination of time off for vacation and paid holidays. Accrual starts from the first day of employment, and paid time off is available after 3 months of employment (unless designated for a paid company holiday). Employees with up to five years employment accrue 5.54 hours per bi-weekly pay period, earning a maximum of 18 days annually. Every five years, the accrual rate increases. Employees with more than 25 years employment accrue 8.64 hours per pay period, with a maximum of 28 days earned annually. All full-time, year-round employees are eligible to earn sick leave. Accrual starts from the first day of employment. Employees with up to five years employment accrue 120 hours of sick time annually. Every five years, the accrual rate increases. Employees with more than 25 years employment accrue 220 hours of sick time annually. Purchase additional term life and accidental death and dismemberment insurance for yourself, spouse or dependents. Full-time employees are eligible to borrow textbooks at no cost for continued education for themselves or immediate family members. Additionally, all employees may purchase textbooks at discounted rates.